Every two years the Federation of Fiber Artists of Texas gets together to refresh creative juices, meet old friends and make new ones, and perhaps learn a new skill or technique. This past weekend, the Dallas chapter hosted the conference in Plano at the Southfork Hotel. The featured speaker was Joan Schulze who let us ‘tour’ her San Francisco studio via a nice PowerPoint Presentation. She also read some of her poems and brought one of her toner drawings for close inspection. I attended two workshops, one on screen printing using paper stencils–something I’d never done before—delightfully messy but I’m proud to say I didn’t get a spot of ink on my new turtleneck or favorite jeans. The bit of orange I got on my shoes blended with their deep tannish color and was mostly on the rubbery front part. The second workshop was on bead embroidery. Alas, it was after lunch, I clearly need new glasses, the room was warm, and I’d been up due to force of habit since 5 and I had to chase the beads around with an incredibly thin beading needle. Beads do not herd well. I can’t say that my screen printing was fabulous but it did give me another way to use screens that is fast and immediate. The nicest screens were the ones cut using an X-acto knife—I’m far too impatient to use operate one in such a short time for something so transient. I opted to cut a few bold lines with my traveling paper scissors and print on some pre-sewn strips as well as some over-dyed white on white—all in pink–my least favorite color—so what did I have to lose? Orange and a rusty turquoise (another unfavorite color) improved them slightly but they need something more. 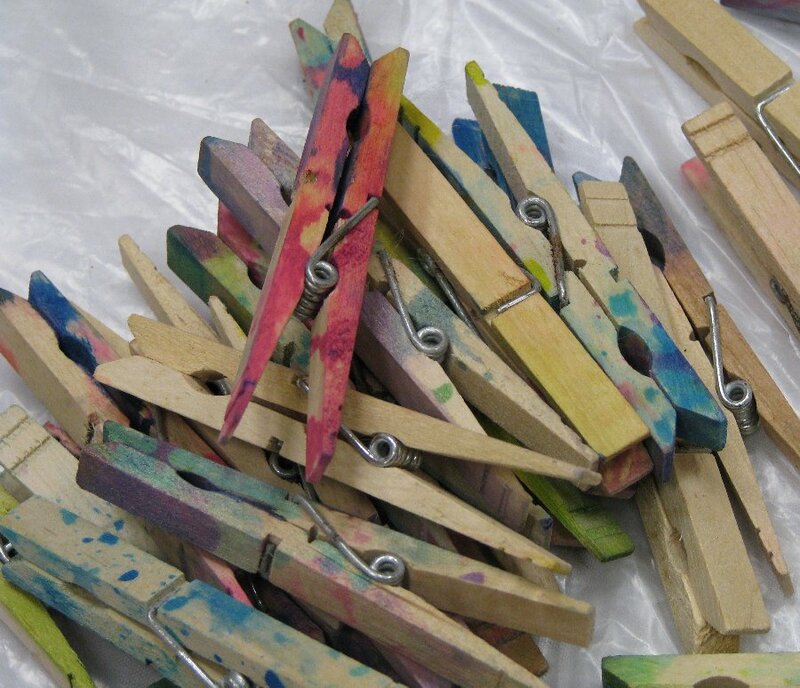 People taking the shibori workshp were wowed and so I took a photo of the clothespins used. They almost missed lunch as did the screen printing folks. The people in Judith Montano’s workshops seemed to disappear–I think they did miss lunch– and the machine needle-felters all fell in love with their machines. Each meal featured wonderful centerpieces on every table. The Dallas chapter decorated boxes in various themes. One had a real clock on it and lots of quotes about time. Another was a miniature airplane hangar on wheels. I did take pics of all of them but my angle was wrong and the tables were covered with the usual tools required for polite dining. I noticed the Dallas folks taking photos—perhaps they’ll put them up on their website. Then there was the fiber show held in the nearby Plano Art gallery. The show was nicely lighted and beautifully arranged by a very energetic young man who seemed to leap up and down that ten foot ladder as though it were a set of two or three stairs. The work itself ranged from relatively traditional quilt type pieces to sculptural. Anne Eckley had several of her wonderful thread-painted landscapes. My favorite was the fenceline portrait. Hanging next to it was another piece that was a partial self-portrait—a slice of face including just the eyes and all done by close hand-stitching. My real favorite though was a piece done by a student in the student show. Three plaid shirts had been cut into strips and used as weft through a dark cotton warp. The buttons from the shirt were then sewn down the middle. It will be hard for the Houston chapter to match all of this when it is their turn in two years. I could already see them nervously chewing their mental fingernails but I’m confident they’ll come up with something equally fabulous.